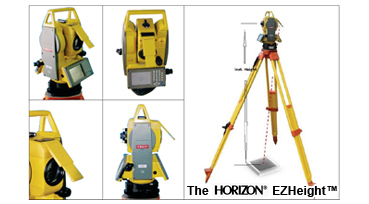 An industrial innovation that is required by every total station, brought to you by HORIZON. Proudly Singaporean, proudly HORIZON. Most surveying jobs started on the total station would require the user to input the instrument height as part of the pre-job requirement. Traditionally, this is accomplished via usage of a measuring tape, a leveling staff or some other measuring tool. The user would then note the height measurement, and input it manually in the instrument. The EZHeight™ system is designed to take care of this entire procedure in a simple step via an integrated device named the EZHeight™. The EZHeight in use on the HORIZON H9 total station. It is the first height measurement integrated device of its kind to be fitted on total stations. a.) Height measurement accomplished in less than 1/3 of the time taken vs usage of measuring tape. b.) Elimination of parallax and human errors using measuring tape. c.) Self-contained height measurement system. d.) Dispenses with measuring tape and other conventional height measure devices. e.) Measures accurately to plumb point without hassle. g.) Automatic capturing and storage of measured height. No need for manual keying, and eliminates human error during this step. h.) Increases pre-job efficiency when working with a total station.